84 min. Touchstone Pictures. Director: Kelly Asbury. Cast: James McAvoy, Emily Blunt, Maggie Smith, Michael Caine, Jason Statham, Patrick Stewart, Stephen Merchant, Julie Walters. 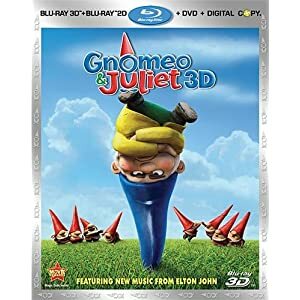 It took nine writers (not counting that story guy Shakespeare) to rewrite Romeo and Juliet into Gnomeo and Juliet, for the kids. And thus the old joke has finally been fulfilled of someone pitching Romeo and Juliet to Hollywood and hearing in response, "Couldn't they live at the end? I mean, it's kind of a downer." While this bit of CGI-animated pop pap will likely offend most Shakespeare buffs (like myself), it works overtime to stick in wan references to the Bard. It should have expended that energy figuring out to what end this story was being retold. It seems to be a plea for garden gnomes to get along, but perhaps I missed a metaphor someplace. Above all, Gnomeo and Juliet turns out to be a not so stealthy advertisement, to a young generation, on behalf of Elton John. At first, I wondered, why on Earth is this lawnmower race between gnomes inexplicably set to “Saturday Night’s Alright (For Fighting)”? It's not even Saturday night. But it turns out that just about every scene features a freshly repainted Elton John hit (there are also two new Elton John/Bernie Taupin songs, “Hello Hello” and “Love Builds a Garden”). That's because—wait for it—John is an executive producer, and his life partner David Furnish a producer, on the film. In the face of all this blaring crocodile rock, Shakespeare seems like an afterthought, believe me. But it's all very sunny, and kids will no doubt happily glue their eyes to it. Nominally corresponding to the original play, Gnomeo and Juliet has a hotheaded Tybalt (Jason Statham); a compatriot for Gnomeo named Benny (Matt Lucas), for Benvolio; a water spout frog named Nanette (Ashley Jensen of Extras) as a Nurse to Juliet; and an unwanted suitor for Juliet in Paris (Stephen Merchant of The Office). At least the opening bit has the good sense to acknowledge, “The story you are about to see has been told before. A lot. And now we are going to tell it again. But different." There's truth in advertising, and it buys a little goodwill before the eventual arrival of unanticipated elements like pink flamingo Featherstone (Jim Cummings); cameos for Ozzy Osbourne, Hulk Hogan and Dolly Parton; the Terrafirminator, “a weapon of grass destruction”; and a total absence of poison and daggers. Disney's Blu-ray 3D + Blu-ray 2D + DVD + Digital Copy Combo Pack packs plenty of value, mostly in the hi-def bells and whistles of its presentation. The 3D presentation is flat-out perfect, working like a charm throughout. Depth is exceptional, as promised, with palpable degrees of depth that extend far beyond foreground and background: the 3D definitely adds something to the film in terms of its animated liveliness, so if you're springing for the movie (and your TV has the capability), you'll definitely want to spring for the 3D. And as with the Blu-ray 2D hi-def transfer also included in the combo pack, the 3D transfer features blazingly brilliant colors, ultra-sharp crispness, detailed texture, and rock-solid contrast and black level. The lossless DTS-HD Master Audio 7.1 mix simply adds to the immersive effect of the 3D, putting you in the garden with all its babbling brooks and assorted spritely ambience, and wrapping the listener in the music, which has dynamism and warmth to spare. The pint-sized collection of extras kicks off with “Elton Builds a Garden” (5:47, HD), exploring John's role behind the scenes and on the soundtrack with director Kelly Asbury, producer David Furnish, executive producer/songwriter Elton John, producer Baker Bloodworth, Michael Caine, producer Steve Hamilton Shaw, composer James Newton Howard, and guitarist Davey Johnstone. Also on hand are two “Alternate Endings with Filmmaker Introductions” (4:05, SD); eight “Deleted and Alternate Scenes with Filmmaker Introductions” (42:25, SD); “Frog Talk with Ashley Jensen” (1:46, HD) with Asbury and Jensen; “The Fawn of Darkness” (1:29, HD) with Asbury and Ozzy Osbourne; and a “Crocodile Rock Music Video” (1:32, HD). All site content © 2000-2019 Peter Canavese. Page generated at 04/20/2019 11:47:58PM.